Sargent Art Poster Paint Sets come in refillable, reusable plastic palette trays. The opaque, water-soluble paints are great for posters and other projects in the classroom or at home. The colors are packaged in 0.75 oz (22 ml) jars molded into the tray to prevent tipping. When empty, the palette can be washed and refilled. The washable-formula paints rinse from skin and most fabrics with soap and water. They're more transparent and have a thick, rich consistency. Sargent Art Poster Paints are certified AP non-toxic and made in the USA. 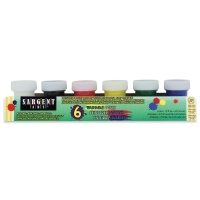 Set of 6 Washable Paints — A classic palette, this set includes Black, Blue, Green, Red, White, and Yellow. Set of 6 Fluorescent Washable Paints — Sure to add eye-catching color to any project, this set includes Blue, Chartreuse, Green, Pink, Red, and Yellow-Orange. 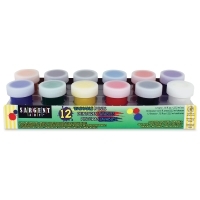 Set of 12 Washable Paints — This set includes Black, Blue, Brown, Green, Magenta, Orange, Peach, Red, Turquoise, Violet, White, and Yellow. Set of 12 Premium Poster Paints — This set includes jars of Black, Blue, Brown, Gold, Green, Orange, Red, Silver, Turquoise, Violet, White, and Yellow. Set of 12 Washable Paints, Combo Pack — This set includes one jar each of Black, Chartreuse, Pink, White, Yellow, and Yellow-Orange, and two jars of Blue, Green, and Red. Set of 6 Poster Paints — This set includes the six most commonly used colors: Black, Blue, Green, Red, White, and Yellow.